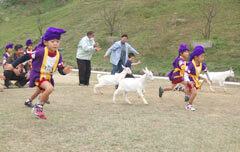 Children enjoy a running race with goats on December 8 at Oishi Park in Naha. On January 8, at Oishi Park in Naha, people fond of goats, or hija as they are known in the Okinawan dialect, held a year-end party and was also designed to foster friendship among people in the community. Many people, including the elderly and local children, participated in the event sponsored by five groups such as the Oishi Park Hija-Lover Club. The participants enjoyed goat races and a contest to imitate the voice of goats. Naha City Mayor Takeshi Onaga made an appearance and imitated a goat’s voice. About 30 children, including some of kindergarten age and the children who were looking after the goats, took part in the race with the animals.